Context: In our focus on Dr. Frank, we will be exploring his and Lucie's magazine further: The Massachusetts Magazine. See Talk page for volumes. See our TMM Page for a link to the TOCs and to the contents of each issue. Earlier, there was some discussion about blogs and genealogy (some are for, some against). Too, one can consider the use of blogs in other fields. Reminder: The technology behind the web was motivated by the need for dispersed scientists, using disparate systems while collaborating, to have easy access to the material that was related to their common interests or to their joint efforts. In brief, a means for sharing results in a more full sense than was allowed by email and attachments (even with ftp). So, we ought to always be poking around the web and establishing some type of structure (will get back to this in a bazaar/cathedral discussion). Not only do new things come forth daily, what is presented from searching is very much a function of search methods and query configuration. In such a mode (no, not trolling), I ran across, again, some more work by Dr. Frank A. and his sister, Lucie M. Namely, the Massachusetts Magazine that they helped get started and supported for several years. My intent is to document this effort on Wikipedia (see my sandbox), but, in the meantime, this pointer is to Vol. I (Google books). In this edition, Dr. Frank writes about "Col. John Glover's Marblehead Regiment." He also has a nice little rundown of "The Founders of the Mass. Bay Colony." On page 82, Lucie M. writes about a meeting of "The Old Planters Society" and mentions "The Gardner Family Association" which we will be researching. Both archive.org and Google have digitized versions of the first meeting of this group (June 9th, 1900). We referenced this meeting in an earlier post (Old Planters, Massachusetts). Vol. I of Massachusetts Magazine was dated 1908. The magazine was still being published in 1917 (see the sandbox for a growing collection of digitized versions). The editor was Thomas Franklin Waters who wrote extensively on Ipswich, MA. 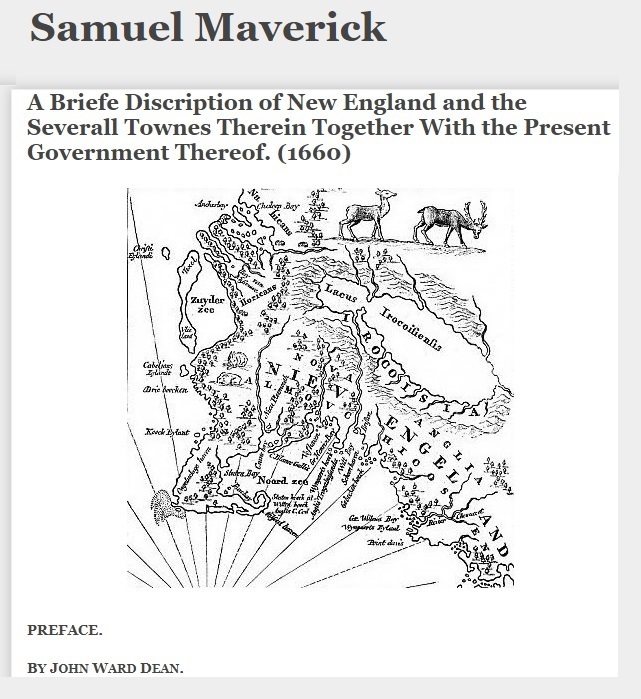 05/21/2015 - Dr. Frank's article, reprinted: John Endicott and the men who came to Salem in the Abigail in 1628. 05/22/2015 - Not to be confused with an earlier effort by T.M. Harris, 1794 (Vol. VI, No.VII). ... Hathi Trust comes through again: list from Harvard and Princeton. 12/18/2016 -- Article about the TMM published in The Gardner Annals, Vol. III, No. 1. 02/16/2018 -- The last issue of The Massachusetts Magazine was in January of 1918. There were several factors that contributed to the demise of the periodical, such as WWI and the draft. As well, we will look more closely at the Spanish Flu which peaked in the fall of 1918 with Boston as ground zero. 02/12/2019 -- While researching earlier, we kept running into references to an old magazine. Did not pay attention until later when we saw Dr. Frank as part of the editorial effort. Then, we found out that he had been a regular contributor, to boot, as well as had his sister, Lucie. So, we dug into the archives and read all of the issues, in a browse mode. We captured the TOC of each issue. These have now all been printed (on paper), after TGA Vol. IV was completed in the fall of 2018. We have a page that is devoted to The Massachusetts Magazine. One goal, all along, has been to tackle this issue. There has been a whole lot written about the subject (see comments on a massive collection) that I have seen the past few years. Anderson punted (Great Migration), but that he did was correct (the bracket around Margaret is a nod to the open issue) given what is known, definitely, at this time, and the genealogists' bailiwick. Some of the thoughts and talks were re-addressed when the Richard III discovery was in the news (and later). We have been considering origins from various angles: motivation, the times, and more. Given the interest, and the amount of material, we will make it a regular topic. Today, I ran across this findagrave page about the Thomas Gardner who died in 1635 (see Farmer and Frank). By the way, I really like the site and its intentions. Notice that the subject that we had multiple Thomas Gardners has been addressed (see summary in this post). When putting together the annals look at Thomas' time for Gardner's Beacon, Vol. II, No. 6, it was interesting to see how references to Thomas, and opinions, changed over the years. Too, seeing the material in this format suggested the usefulness. Expect a more full "annals" to be collected. Similar to this, there will be a list of things on the web. This work is for informational purposes only. Analysis will come later. Without a proper structure and indexing, there is just too much which can complicate matters more than necessary. Much of the web material points elsewhere, so we will track those. Sound like a lot of work? Yes, but, taking incremental chunks will allow regular report. Of course, the question of resource comes up: yes, we'll collect elsewhere and point there from the blog. Now, one benefit will be to collect look backs that were done in good faith. Notice that the annals report (see Beacon reference, above) lists various look backs that happened over the years. Fortunately, we had some that were almost current. Actually, Rev. Hubbard was of the time of Thomas' offspring. Some of these look backs go back across the pond. Some proposals (conjectures?) appear to be interesting. Some have a lot of supporters. We will get these laid out, even those that have been shown to not have much (or little or no) support. If you would like to contribute to the collection of material, please send an email. Especially, I would like to hear thoughts about Thomas' ancestry (John Goff's take, for instance). Actually, across the breadth of progeny, are there stories, etc., that ought to be brought forward? Which brings up resource, again. We attempted, unsuccessfully, a Forum approach (see summary) last year. What method would be good to use (robust, secure, friendly, etc.)? 05/22/2014 - Removed the redundancy from the title; kept it on the file (emphasis). 07/02/2014 -- Featured in Gardner's Beacon (TM) Vol. IV, No. 2. 07/12/2015 -- Okay, turtle speed. But, we get there. Announcing a new project: Sherborne, Dorset. No doubt, it is about time. When finished with the data collection and analysis, we will present the strongest story (the prerogative of the family) that the facts, and abductive reasoning, will support. As such, we hope to demonstrate some very much needed research viewpoints. 08/06/2016 -- More on All things Gardners. 09/25/2018 -- Recently the Profile for Thomas Gardner on WikiTree changed to only have the two wives. This was due to research and discussion to which Gardner Research contributed. Earlier, there was a post that summarized the issue and accomplishment: Margaret, anew. Thanks are extended to all who made this update possible. 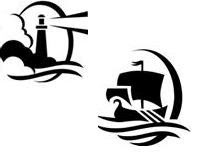 The Profile is managed by the Puritan Great Migration Project sponsored by the NEHGS, publisher of the Great Migration books. So, Sherborne, as John said (see this page for images of documents). We have seen genealogy sites abound since people could get onto a network with their personal computer, early on with dial-up modems (does that age me?). Some of the real old ones are still around with little or no modernization (but, then, technology ought to be backward compatible - thank you, AOL, for instance); many have disappeared. Then, along came blogs (yes, these, as with FB, are things of recent memory - by the way, rather than bemoan computing, perhaps, old-encrusted genealogists ought to talk the universals - that, by the way, written by a 72 year old). Now, blogs are great, for many reasons, even if they are not peer-reviewed, in the traditional sense (but, even those things looked at by peers can have errors - errata exists for that reason). The crux? As one searches, and I have been trolling the internet for five years now (in a smart manner to be described) thereby collecting 1000s and 1000s of things to parse and digest, one can get hits from all types of things of differing characteristics in terms of believability (being kind - too, though, pointing to the basic foundational issues of knowledge). From time to time, little gems pop up, like this thing on Samuel Maverick. What I have read so far is wonderful. And, remember, it is in the context of Thomas Gardner's very large extended family. Note, though, that there is only one day's worth of input (albeit quite large). Families ought to provide, for the rest of us, some condensation of the myriad of things written about their ancestors. We can discuss (the Thomas Gardner Society intends to address this need further - ah, yes, in the old context of requirements -- for now, note that the bibliography includes links to books, et al, emphasizing on-line, even Anderson's work is available on-line via NEHGS for researchers). 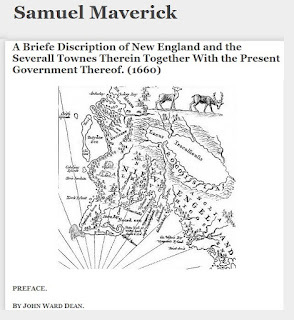 But, I had not earlier seen what Samuel wrote about New England: A Briefe Discription of New England and the Severall Townes Therein Together With the Present Government Thereof. (1660). I found the little bit that he wrote to be very informative. Why? He wrote it from knowing (see above) and having been there. Aside: Of course, the post is being written from the perspective of a non-New Englander who is of the western mindset (big sky and all) by experience. On being introduced to the New England story (that is, beyond Thankgiving's little look at Plymouth), I had to take a crash course in the geography of Essex and its cohort counties. Let's set a little example. There is a trail, used in the mid-1800s, across a western state where the wagon crews took three weeks to traverse (daily grind - no, not mountainous terrain, rather the trials of prairie (say, like the Ingalls saw) travel - modern drivers are way off the mark from saying flat lands - as their perspective is biased from the leveling that results from engineering/paving roads) from one major location to safe stopping point. Nowadays, we can do the same journey between the two cities (one large and one small) in a morning's drive. Essex, actually Massachusetts, would fit within that area multiple times. ... Yes, we will be looking at the western migration of Gardner, and related, families. Samuel's descendants were involved in the west, to boot. 03/02/2019 - Added the image as we are building an index via images on our portal to truth. 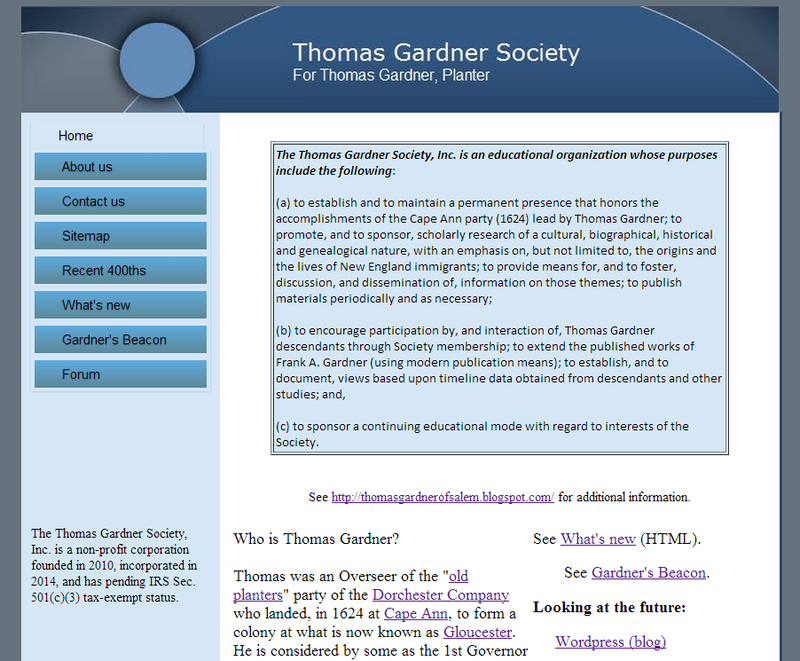 This post announces the arrival of the Thomas Gardner Society, Inc. the predecessor of which was founded in 2010. For purpose of the TGS, Inc. and for other information about the Society, see the website. Aside: The website will be in an update mode for a bit (see tech blog and posts in this blog related to CMS.). Part of the effort will be providing publication of in-depth articles on topics related to Thomas' descendants and the modern world. 07/02/2014 - Issue Vol. IV, No. 2 of Gardner's Beacon(TM) will provide a look at incorporation details. 08/11/2014 - The Thomas Gardner Society, Inc., a non-profit corporation, has IRS Sec. 501(c)(3) tax-exempt status dating from April 29, 2014. 03/02/2019 -- Notice that the image is before the reconfiguration. Also, we are building an index via images at our portal to truth. We'll have to pull these together, at some point. Right now, let's just point to the new blog (Vita Brevis) sponsored by the NEHGS (new 2014). I have been following some of their posts; the one today really got my attention (The Great Migration Study Project: A Primer). Why? 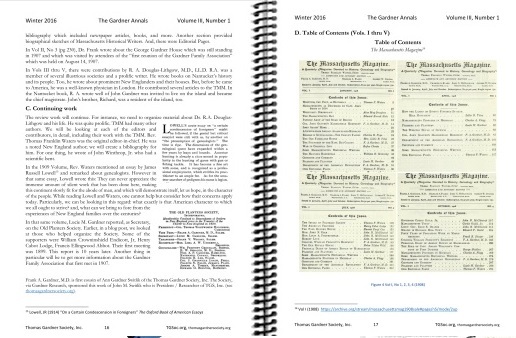 That the GMS publications are available at the ancestor.org site has been great. So, I have used their site quite a bit. But, seeing the post, reminded me of the project area which I went to look at again (not having visited it for awhile). And, I found this index. It lists the immigrants, alphabetically, and provides the arrival year (as determined by the GMS researchers), the first residence, and Series/Volume/Page. There are seven Gard(i)ners listed. Thomas is noted as being found at GMB 731-37. There were a couple of resource posts last year. The first motivated by Heather's comments about Cindy Crawford's ancestral story as told on WDYTYA. Then, later, I found that the Massachusetts Soldiers and Sailors ... volumes are digitized via archive.org (see index to volumes). Three years ago, I saw one genealogy blogger write that he was reducing his blogging effort and would be removing some of his posts. Of course, I had to weight in (On blogs and other modern means), after all Gutenberg's time, while still here, started long ago. But, issues there remain open (wild-west, insecure internet, for one). Let's say that seeing the NEHGS step up to blogging is an encouraging sign. 05/06/2014 - I actually commented on one posts about "Quality persons" as there was reference to a book which is, thankfully, available on-line.